MMA Is More Important Than Boxing!! There were two fights vying for America’s attention Saturday night. One was on free TV and one was on Pay Per View. One ended in a spectacular knockout and one ended in controversy. One mattered and one didn’t. One was Mixed Marshal Arts (MMA) and one was boxing. MMA made history and boxing gave us more of the same. MMA (and specifically the UFC) has become more important than boxing because they continually give the fans the fights they want to see. And now they are giving them away for free. The UFC Heavyweight Championship fight between Can Velasquez and Junior Dos Santos made history. It ushered in a new era for the fight game. MMA detractors will say that Dos Santos’ 1:04 knockout of Velaquez made the fight anti-climactic but they are wrong. It’s those types of knockouts that make MMA exciting. The last time there was any excitement in boxing’s heavyweight division was when Mike Tyson was knocking out fools in the first round. No one was complaining about the length of the fights then. Knockouts are exciting. Knockouts leave no doubt about who won the fight. Which brings us to the fight between Manny Pacquiao and Juan Manuel Marquez. Boxing didn’t do itself any favors with this fight. While Pacquiao won the fight it was not without controversy. And it didn’t bring us any closer to the fight we all want to see which is Pacquiao versus Floyd Mayweather. I’m still convinced that fight will never happen. If they were both in the UFC that fight would have already happened. And it probably would have happened twice. Fighters can’t run from other fighters in the UFC. (Floyd, I’m looking in your direction). Putting a Heavyweight Championship fight on free TV was the best thing the UFC could do. It’s been over two decades since any heavyweight championship fight was on free TV. People in their late twenties probably don’t even know that fights used to be broadcast for free. MMA was introduced to mainstream America in a great way, with a fight that truly mattered and one that ended in an exciting fashion. This was the best advertisement the UFC (and MMA) could have hoped for. The UFC (and MMA in general) is better at marketing their product than boxing has ever been. It also helps that they have a superior product. Boxing is in trouble because they don’t give fans the fight they want to see and the governing bodies have become so corrupt that nothing can get done. When was the last time you were really excited about a boxing match? If we’re lucky, we get one good fight a year. That’s no way to build a sport. Boxing will probably not follow UFC’s lead and put championship fights on free TV and that’s a good thing. For the UFC. A New Era For The Fight Game! There was a time when you could watch the biggest fights for free. I know most of you have no idea what I’m talking about but trust me, it happened. Of course all the big fights were boxing matches because there was no Mixed Marshal Arts back then. But you could watch Sugar Ray Leonard or Larry Holmes fight for free. All you had to do was turn on you tv. And then all the Big Fights went to Pay Per View. And now there really are no more Big Fights in boxing. As fans we never get to see the match ups we really want. (Floyd Mayweather I’m looking in your direction). That is why I have become such a big MMA fan. They continually give the fans the match ups we want to see. Fighters are not able to duck other fighters in MMA they way the can in boxing (still looking in your direction Floyd). This is mostly due to the fact that there is really only one main organization in MMA and that is the UFC. They demand that top fighters will fight other top fighters. Boxing has so many governing organizations that have become so corrupt you almost never see a Big Fight any more. When was the last time you were really excited about a boxing match? Think about it. Be honest, it was a while ago. I get geeked for at least one fight for every UFC event. Hopefully the Velasquez/dos Santos fight will be the return of the Big Fight to free tv and will usher in an era of MMA dominance in the fight game. 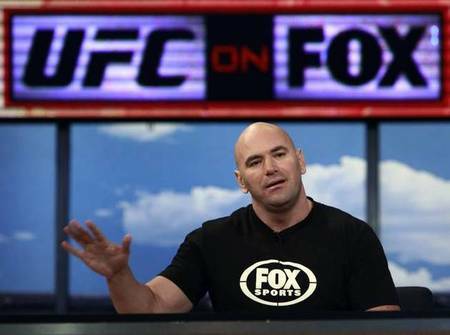 Every boxing promoter should take a lesson from Dana White and the UFC: give the fans what they want. Kimbo Slice Cut From UFC! Return to YouTube Eminent!! The Kimbo Slice era of the UFC is now, thankfully, over. After an embarrassing loss Saturday night at UFC 113 to former NFL player Matt Mitrione, Kimbo Slice is no longer in the UFC. And hopefully his MMA career is over as well. UFC president, Dana White, did the only thing he could do; he promptly fired Kimbo after the match. “That was probably his last fight in the UFC,” White said immediately after the fight. While it was interesting to see this YouTube star parlay his internet fame to an actual fighting career, it was clear from the start the Slice was out of his league. After an embarrassing 14 second knockout in the now defunct Elite XC fight promotion to Seth Petruzelli, Kimbo got another chance when he was allowed to be in the Ultimate Fighter reality show. It quickly became apparent that Kimbo did not belong there. After being defeated by eventual Ultimate Fighter winner Roy Nelson, Kimbo was given a slot on the live finale. While he won a decision over Houston Alexander, Kimbo did not look as if he made any major advances in his MMA skills. While I’m sure we will see Kimbo on TV in the near future, I’m hoping it will not be in the octagon. I’m sure there will be an opening on “Dancing With the Stars” or “Celebrity Rehab with Dr. Drew.” Until then, there’s always YouTube.